The photos of the event suggest a great atmosphere. I know Ben Lane and the members of G.S.Metro love the hill climb season, so it’s good to see the passion translate into a great event. 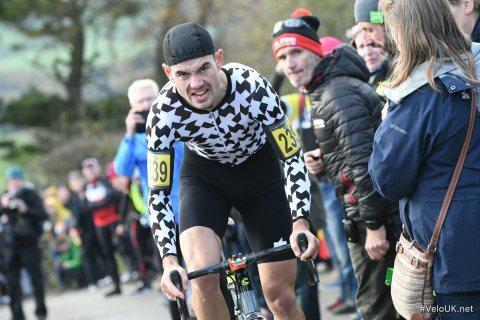 It’s also not just about the podium contenders – nearly 240 riders got the chance to ride a special event – with closed roads and enthusiastic spectators. I imagine it’s no small fear organising and time-keeping for that many riders in a major championship. Great to see the enthusiasm of spectators, but I’m not sure ‘shameless blokes in mankinis’ was ever meant to be an integral part of the hill climb championship! It was good to hear the guest of honour was Jeff Wright. He was national champion once and finished 2nd place on six occasions. Many of Wright’s course records still remain, Norwood Edge 4.42 will forever be etched on my mind. As far as I know, next year is Shelsey Walsh. It will be the first championship down South for ages! If we get a full field of 240 in the far north east, next year will almost certainly attract a lot more. A central location and iconic venue will surely attract a big field. There will be new names and the return of some two minute specialists who sat out this year (e.g. Isaac Mundy, 2nd in 2016). Who will win next year? It’s very open. If you have any photo albums, videos leave the link as a comment below. 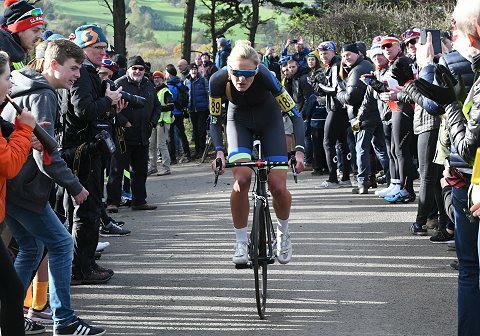 The post National hill climb 2017 – results appeared first on Cycling uphill.